My best Basant song is Ketaki gulaab joohi champakban phoole sung by Bhimsen Joshi and Manna Dey. Penned by Shankar Kesarilal who later came to be known as Shailendra, its composers were Jaikishan Dayabhai Panchal and Shankar Singh Raghuvanshi, the duo world knows as Shankar-Jaikishen. We are in midst of Basant. In fact, the Basant is already three weeks old. Basant Panchami marks the beginning of spring and falls on the fifth day of Maagh each year. The month of colours, Phagun, is still a few days hence. In Lahore, Rawalpindi, Sialkot, Faisalabad, Kasur and across all of the Punjab, this festival is energetically celebrated as ‘Jashn-e-Baharaan’ (Celebration of Spring). The song, Ketaki Gulaab…, was playing on the mobile as I chanced upon patches of ‘flames’ on the horizon on my way to my farm. As I proceeded I came across the roadside littered with ‘flames’. By flame I mean Flame of the Forest or Palash flowers. Its botanical name is Butea monosperma. The name ‘palash’ comes from Plassey in West Bengal which the world knows. The Battle of Plassey was a decisive victory of the British East India Company over the Nawab of Bengal and his French allies on 23 June 1757. The battle established the Company rule in Bengal which expanded over much of India for the next hundred years. The battle took place at Plassey (anglicized version of Palashi). I have written about Palash earlier but this time around experienced something different: I enjoyed the nectar which sits between the receptacle and peduncle (stalk of the flower). I squeezed it and several drops of liquid, like honey water, entered my mouth. 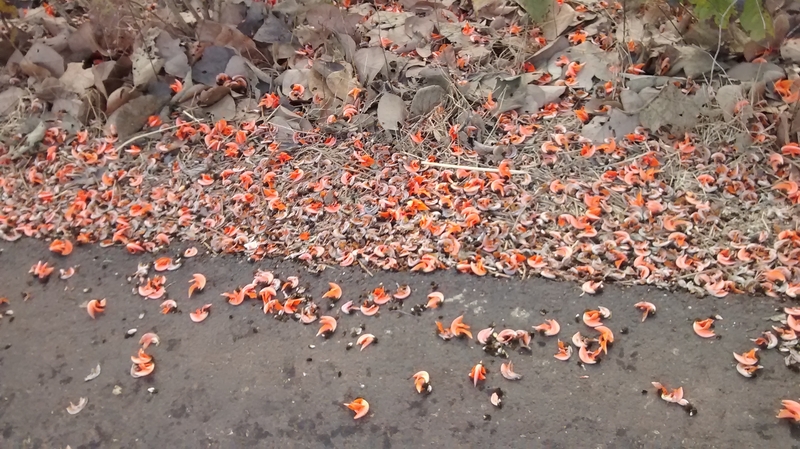 So this is what brings the bees, the ants and the birds in hordes to the orange-red flower of Palash! You need to drink the nectar early in the morning for as the sun rises the nectar dries up, again to be restored in the morning. I didn’t know that Nature has designed Palash flower to be very energy efficient until I came across a longest piece ever written on the flower. Shubhasish Mitra @muktadhar.org on Flower of Shantiniketan: Palash elaborates: The different orientation of individual buds suggest that each flower of Palash will be aligned differently to the Sun, so that some faces of the whole bunch will always face the Sun. As the petals of an individual Palash flower open at least in 3 directions, combined with each flower making a different angle with the branch, Palash looks bright from all angles of Sun- whether it is dawn or dusk. This is the first rule of geometric symmetry Palash follows- orientation towards the Sun from all conceivable angles. It is in fact a quality most of the flowers adapt, but none so magnificently like Palash. Calling it an ‘intelligent tree’, he writes further: Imagine solar panels of smaller dimensions (maybe at size of a palm) arranged in a 3D geometrical space like the petals of Palash and then arranged perhaps like the branches- the design may be complex, the idea quite wild perhaps, but it has every theoretical chance to be more energy efficient than flat solar panels! Though Palash is attributed to have medicinal properties, I came across a first person account in Ashok’s blog, someitemshave.blogpost.in, here he mentions that taking tea made of dried Palash flower has helped him to get relief from his stiff back, acquired due to long hours sitting in front of the computer. This Sunday I plan to collect as many flowers I can and dry them to be used later. Kalyan is a prestigious Hindi title published by the Gorakhpur Press. It has special issues devoted to the deities, mantra and spiritual issues. Few years back, my friend Kaushal took me to the Marine Lines-based shop who stock Gorakhpur Press titles. I picked up Kalyan’s issue on health. The 500-page long book is modestly priced at Rs 175 and has gems of information gathered over the years by the editors from ayurvedic and naturopathy practitioners. Here is one I would like to share. It’s for agelessness and ushering of good health. No, not the anti-ageing cream variety which promises you wrinkle-free complexion at a price. Whether the cream is effective or not only time will tell (By then Madhuri Dixit, Sushmita Sena, Karishma Kapoor and other good-looking women will no more be around. And if around will not be of interest to us). We know what happened to the users of whitening creams. I heave realised that nature’s secrets are easy but not advertised during prime time. That’s why we don’t realise their importance. We all have become suckers of prime time—from what we put in our mouth to what we apply on our skin and hair. •	Take 40g of wheat and 10g of methi (fenugreek) seeds and immerse them in a half glass of water. After 24 hours take the seeds out and hang them inside a piece of coarse cotton cloth. •	Don’t throw the half glass of water in the sink but add juice of a half cut lemon, 2g dry ginger powder and 2 tbsp of honey. Stir it well and drink. •	24 hrs later, by then the seeds in the cloth may have germinated. Spread them in a plate, add powdered black pepper and a pinch of rock salt for taste. Eat it after chewing it thoroughly. Why this is called ‘nectar of life’ and why it keeps age at bay? Two tablespoons of raw wheat germ have about 1.5g of unsaturated fat, 9g of carbohydrates, 4g of protein, 2g dietary fibre, 2g of sugars, no cholesterol and about 60 calories. This is plenty of protein and fibre. Unfortunately, this kernel, which includes the wheat germ, is tragically removed during the refining of whole wheat grains to white flour. In the manufacturing process, it is removed because its healthy oils can go rancid quickly, so removing it makes it easier for food production companies to keep wheat in storage longer. The germ itself only makes up about 3% of the kernel, and you need over 50 pounds of wheat to get one pound of wheat germ. While most of us get more than enough wheat in our diet, because the wheat germ is removed, we are usually not getting the best part of the wheat. Additionally, it has B and E vitamins, Phytosterols, Omega-3 fatty acids, minerals like iron, zinc, magnesium, calcium, selenium and manganese. Our body needs minerals to repair itself and run the chemical reactions that keep us healthy. Fenugreek appears to slow absorption of sugars in the stomach and stimulate insulin. Both of these effects lower blood sugar in people with diabetes. Fenugreek is also used as a folk or traditional remedy for diabetes and loss of appetite, and to stimulate milk production in breastfeeding women. It is also applied to the skin for inflammation.